classification: samples belong to two or more classes and we want to learn from already labeled data how to predict the class of unlabeled data. An example of a classification problem would be handwritten digit recognition, in which the aim is to assign each input vector to one of a finite number of discrete categories. Another way to think of classification is as a discrete (as opposed to continuous) form of supervised learning where one has a limited number of categories and for each of the n samples provided, one is to try to label them with the correct category or class. Machine learning is about learning some properties of a data set and then testing those properties against another data set. A common practice in machine learning is to evaluate an algorithm by splitting a data set into two. We call one of those sets the training set, on which we learn some properties; we call the other set the testing set, on which we test the learned properties. To load from an external dataset, please refer to loading external datasets. An example of an estimator is the class sklearn.svm.SVC, which implements support vector classification. The estimator’s constructor takes as arguments the model’s parameters. In this example, we set the value of gamma manually. To find good values for these parameters, we can use tools such as grid search and cross validation. Now you can predict new values. In this case, you’ll predict using the last image from digits.data. By predicting, you’ll determine the image from the training set that best matches the last image. As you can see, it is a challenging task: after all, the images are of poor resolution. Do you agree with the classifier? joblib.dump and joblib.load functions also accept file-like object instead of filenames. More information on data persistence with Joblib is available here. scikit-learn estimators follow certain rules to make their behavior more predictive. These are described in more detail in the Glossary of Common Terms and API Elements. In this example, X is float32, which is cast to float64 by fit_transform(X). Here, the first predict() returns an integer array, since iris.target (an integer array) was used in fit. The second predict() returns a string array, since iris.target_names was for fitting. Here, the default kernel rbf is first changed to linear via SVC.set_params() after the estimator has been constructed, and changed back to rbf to refit the estimator and to make a second prediction. 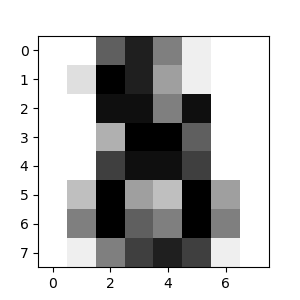 Here, the classifier is fit() on a 2d binary label representation of y, using the LabelBinarizer. In this case predict() returns a 2d array representing the corresponding multilabel predictions. In this case, the classifier is fit upon instances each assigned multiple labels. The MultiLabelBinarizer is used to binarize the 2d array of multilabels to fit upon. As a result, predict() returns a 2d array with multiple predicted labels for each instance.